DIRECTIONS: This cemetery is located just off Route 374 at the end of the first dirt driveway on the west side, .2 miles south of the intersection with the Spear Hill Road which is opposite the Clinton County / Town of Ellenburg sign. As you enter the dirt road, bear right around the bend. 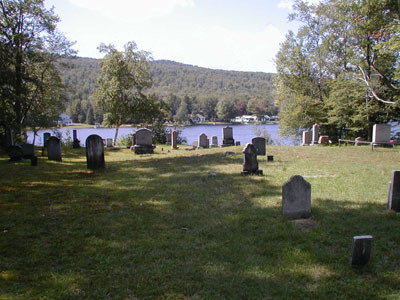 The cemetery is at the end of a dead end road, on the lakefront. This cemetery was visited by H. McLellan, C. McLellan, & H. Bredenberg on June 15, 1946.Thanks to Wayne Miller, Librarian at Special Collections, SUNY Plattsburgh, Plattsburgh, New York for access to McLellan's Cemetery Collection. Cyntha Dau. of C. & B. E. BEGOR Died Sept. 23, 1892 AE 2 Ys. 13 Ds. Denny Wife of W.M. BLAIR Died July 24, 1908 AE 51 Yrs. Elbry Died Apr. 31, 1884 AE 8 Dys. Alma Died Sep 18, 1884 AE 5 Mos. Milton Died Feb. 13, 1893 AE 1 Yr. 2 Mo. Selina Wife of N. CHESMORE Died Dec. 21, 1896 AE 74 Yrs. Pearl July 3, 1907 AE 1 Mo. Nathannal COLLINS Died Feb. 21, 1906 AE 77 Yrs. Orson His Son Oct. 17, 1907 AE 36 Yrs. Zipporah Wife of Nathanl COLLANS Died May 15, 1896 AE 56 Yrs. Carrie M. Died Apr. 1, 1885 AE 1 Mo. & 15 Ds. Cynthia L. Died Sept. 4, 1887 AE 9 Mos. & 19 Ds. Millie H. Died June 19, 1889 AE 8 Mos. & 23 Ds. Edna COLLINS Wife of W. R. FIFIELD Died July 23, 1909 AE 53 Ys. John W. Son of W. R. & E. FIFIELD Died Apr. 23, 1883 AE 9 Ms. & 28 Ds. William FIFIELD Died Mar. 28, 1885 AE 63 Yrs. & 3 M.
A member Co. B. 92 Reg. N.Y. Vol. Elizabeth L. Wife of John GADWAY Died Nov. 10, 1897 AE 20 Yrs. 4 Mos. Eli GILBERT Died Mar. 18, 1872 AE 60 Yrs. Co. A 6 Reg. N.Y. Cav. Laban HARRIS Died Apr. 27, 1899 Aged 88 Yrs. Gone but not forgotten. Dorcas Wife of Laban HARRIS Died March 11, 1882 AE 72 Yrs. & 1 Mo. Liddia M. Wife of Tyler HARRIS Died Apr. 29, 1907 AE 68 Yrs. Theopolus HULBURT Died 1906 AE 66 Yrs. Co. H 142 Reg. N.Y.Vol. knoweth them that are his. Bertha Wife of Charles HURLBURT Died Aug. 22, 1894 AE  Yrs. & 5 Ms. John KING Died July 27, 1898 AE 51 Yrs. Co. B. 1 Reg. N.Y.A. Edwin I. McPHERSON Died June 16, 1900 AE 41 Yrs. Owin Son of E. J. & C. D. McPHERSON Died Dec. 24, 1902 AE 17 Yrs. Footstones: Edwin I., Owin, Leslie F.
Eben McPHERSON Died Feb. 2, 1908 AE 84 Yrs. George L. McPHERSON Died May 15, 1907 AE 65 Yrs. Darius W. MERRILL Died Apr. 12, 1887 AE 58 Yrs. Sarah W. WALBRIDGE Wife of D. W. MERRILL Died Apr. 20, 1919 AE 80 Yrs. Emma A. Wife of C. E. MERRILL Died Apr. 19, 1891 AE 28 Yrs. Kittie A. Their Dau. Died July 22, 1905 AE 17 Yrs. Arthur R. Son of C. & A. ROBINSON Died Oct. 22, 1893 AE 11 Yrs. & 3 Ms. clear the God of life and love. Clementine M. Dau. of R. & A. ROBINSON Died July 21, 1884 AE 3 Yrs. 10 Mos. & 8 Ds. Henry A. Dau. of C. & A. M. ROBINSON Died Aug. 17, 1885 AE 7 Mos 12 Ds. Harry B. Son of F. E. & A. M. SHUTTS Died March 8, 1890 AE 6 Mos. & 7 Ds. Corp. Co. G. 98 Reg. N.Y.Vol. Reinlisted Co. D. 98 N.Y.
Jennie M. Wife of James N. SMITH Died June 26, 1904 AE 59 Yrs. Clarence L. Son of S. W. & S. SPEAR Died Sept. 28, 1888 AE 4 Ms. & 19 Ds. Claude L. Son of W. H. & H. L. SPEAR Died June 9, 1882 AE 2 Ms. & 23 Ds. Claudia H. Daut. of W. H. & H. L. SPEAR Died Sept. 5, 1882 AE 5 Mos. & 19 Ds. PFC CO I 391 INF REGT. Silas SPEAR Died Dec. 12, 1877 AE 65 Yrs. Anna His Wife Died Oct. 7, 1880 AE 74 Yrs.